LeVian Deep Sea Blue Topaz ring with 1/6 ctw of chocolate diamonds and 1/8 ctw of vanilla diamonds. 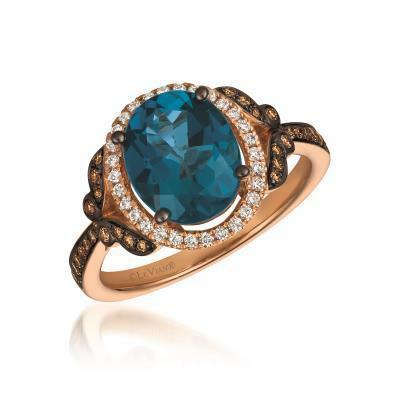 The Blue Topaz set into the center of this 14k strawberry gold ring is a 3 ct. The halo of vanilla diamonds surrounds the deep sea blue topaz.